"With all the failed spoof films of the last two decades, it’s hard to imagine a time when the genre was creating laughs instead of inducing cringe-worthy moments." With all the failed spoof films of the last two decades, it’s hard to imagine a time when the genre was creating laughs instead of inducing cringe-worthy moments. Director Mel Brooks led the genre as he churned out classics like Blazing Saddles and Young Frankenstein, but it may be his 1987 film Spaceballs that has produced the biggest cult following. Today, the film can easily be seen as a time machine including comedic depictions of Star Wars, a Winnebago, and the unhuman-like sounds of Michael Winslow. Spaceballs focuses on Lone Starr and his partner Barf, a mog (half man half dog), who save princess Vespa from the evil Dark Helmet. Once saved, the group must stop President Skroob and Dark Helmet from removing planet Druidia’s oxygen. Already sounding like a Star Wars knock off, the film’s set and costume designs further absorb viewers into the world of satire as they resemble the likes of 1980’s sci-fi, while still holding their own touch to the already diverse world of space films. Bill Pullman leads the cast as Lone Starr, an amalgamation of Luke Skywalker and Han Solo with a touch of Pullman’s own comedic flair. Lone Starr’s personality teeter tooters from a stern hero to a buffoon, making the performance all the more enjoyable. As foolish as Lone Starr is, the character fits in with the unique style of Mel Brooks. The entire catalog of actors, including the late John Candy and Joan Rivers, give performances that strengthen the film, however it is Rick Moranis who runs the show. As the short in stature black tied Dark Helmet, Moranis borderlines the iconic stature of Darth Vader in a very different way. 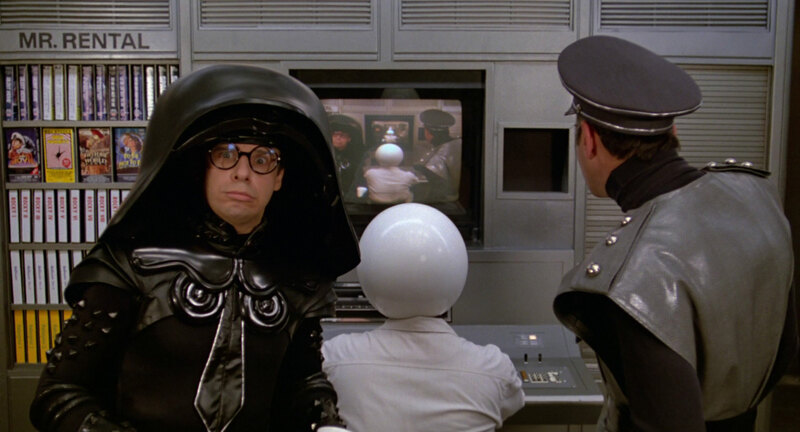 Producing most of the memorable lines, Spaceballs’s comedy derives straight from Moranis who portrays a child-like moron with power to control the galaxy. The comedy in general may not appeal to casual movie goers of today, but fans of satire will find it one of the best within the genre. The humor, while incredibly immature at times, works within the universe created by Mel Brooks, especially for its self-awareness and breaking the fourth wall. Breaking it down, Spaceballs is a prime example of brilliance through stupidity. For younger audiences, the question, “Is this really one of the greatest comedies ever made?” arises. Chances are if you aren’t a fan of edible crime lords, virgin alarms, or yogurt with strawberries then Spaceballs isn’t the film for you. The film may not be perfect, but it has a sense of charm which highlights the iconic characters who produce laughs time and time again.